So amazingly I am back on early shift at work rather than the late shift. So on Wednesday I finished at 1.30pm, popped home to change and headed over to St. Albans to do a little shopping. It was also my staff meal on Saturday (few days ago) so I wanted to have a look for a shirt to wear - as the shirts in my wardrobe have been a bit over-used on nights out. The main reason for going to St Albans and Boots was due to the fact I didn't have much facial creams or washes for my face apart from face scrub which is a bit rough for my face. So I opted to go to Boots as I had a couple in mind and I knew I would get them there. I ended up getting the 'Simple' range of facial creams and facial wash. For 2 reasons ... 1. Because I had recently watched Zoella's Youtube and they were featured in her video. and 2. Mainly because they are good for sensitive skin and my skin ... is probably the sensitive skin you'll ever come across. I wanted to get a facial wash that was easy and quick to use as when I'm getting up at 4am for work - I can't be hassled with a fancy, laborious, long morning facial routine. So I bought the 'Simple' Moisturising Facial Wash (pictured above - on the right). It's pretty simple to use - wet your face, rub some on your hands, rub on your face, wash off. End of ... none of this ... leave on for 10 minutes or do it twice ... simple and easy :) I suppose that's why they call it 'Simple'. I also bought some moisturiser, I was looking for the SPF 30 but they didn't have any in stock so I settled for the SPF 15 which is the same but less SPF. I didn't realise you could get creams that strong in SPF if I'm honest. This cream as mentioned on the bottle is a 'light moisturiser' (pictured above - in middle) so it doesn't feel heavy on your skin. It's very light and absorbs pretty quickly - which is a bonus for me as I don't want to be running around waiting for cream to dry on my face when I trying to get ready or pulling clothes over my head and getting cream on them (not that I put layers of it on my face). Boots at the moment have a deal on for 'Simple' products so its 3 for 2 ... so I spent a good 15 minutes trying to pick my third product but couldn't decide so I got another day cream ... which thinking about it now I could have a gotten a night cream as I'm running low on that I've noticed. That one is very similar to the moisturiser but a bit thicker. To be honest with you guys though I've not used it yet but have looked inside and dabbed the cream on my arm to see what the texture was like. Here are the links to the above 3 items (if you feel like checking them out of Boots) Feel free to shop around though as Boots are expensive and I know you can get these products in other shops - cheaper. I also bought two amazing products which came highly recommended by a couple of blogs I have read recently. So the first product I have is the 'Super Facialist by Una Brennan' - You get a 125ml bottle for £5.99 (currently on special in Boots, so normally £8.99). Starting with the bottle - we have a grey bottle with green writing and a white lid. I actually think it looks rather professional and high-end regardless of it only being £5.99/£8.99. The image is of an atom which I think is to do with the fact that the use 'nature' and 'science' to help your skin. The product also includes 'salicylic acid' which helps with 'unclog congested skin'. The liquid inside the bottle is thin, but not too thin, so it was very easy to apply in my opinion. Once applied I set a timer for 5 minutes and wandered round my room tidying it up. As I did this I could feel the mask harden slightly and it became harder to do facial expressions (picture me looking into my mirror making weird faces - I looked rather odd). After 5 minutes I washed it off with my hands in the sink and patted dry with a towel. I will admit (as I mentioned above) my face is very sensitive so I don't know whether it was due to the fact this is the first time I've used this product or maybe the acid in it was too strong but my face felt like I had sunburn on it and was very sensitive for a few hours after the mask was off. However my face did feel smoother :) So obviously it works. All in all a good product ... I will continue to use it and see how my face feels afterwards, but would recommend to anyone whose looking for a new face mask to try out. 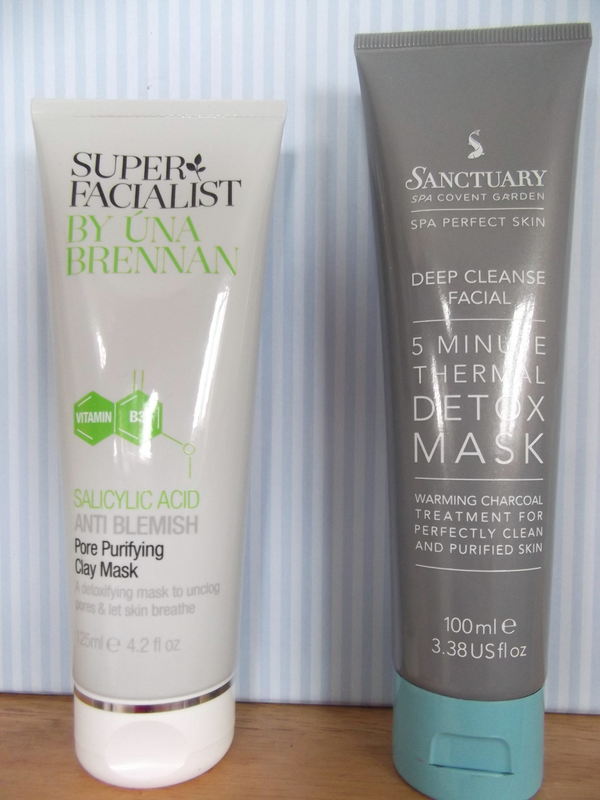 The second product I bought was the 'Sanctuary 5 Minute Thermal Detox Mask' - This is a product by Sanctuary Spa/Covent Gardens. This is different to the other face mask in the fact that when you apply it - it heats up on your face (hence why its a 'thermal face mask'). This is the most weirdest feeling ever. For those who have never tried it before I highly recommend you do - you won't be disappointed. The texture of the mask is quite thick which meant it took me longer to put on than the last face mask however still a good face mask and well worth the money. It was £7.00 in Boots as it was on special (I believe it still is, as the time of writing this) however it is normally £10.50 which some people would say is a bit pricey for a tube of face mask.